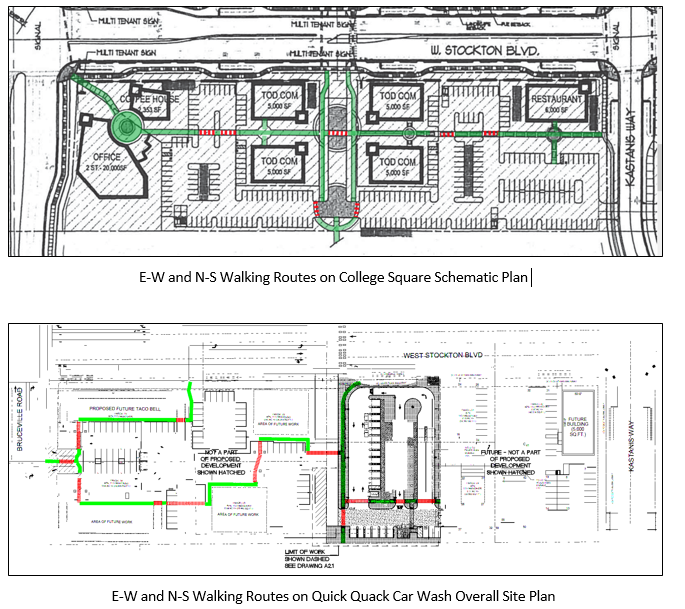 On Thursday, May 24th, the City of Sacramento Planning & Design Commission approved the development of a Quick Quack Car Wash in the College Square South site on Bruceville Road just east of Cosumnes River College. The project site is within 1/4 of a mile of a light rail station and designated as a Transit Oriented Development (TOD) commercial site where the City states it “shall discourage low-intensity and auto-oriented uses around transit stations.” After testimony in opposition from the Sacramento Air District, Sacramento Area Council of Governments, Regional Transit, WALKSacramento, and the Sacramento Area Bicycle Advocates, the planning commissioners expressed their sincerest support of Transit Oriented Development but still approved this project. Actions speak louder than words. Part of the Planning Commission’s argument for approving this car-only use was that the site itself did not look like a TOD. Although the development is bordered by two arterial roadways, it is proximate to several hundred existing and future planned residential units. 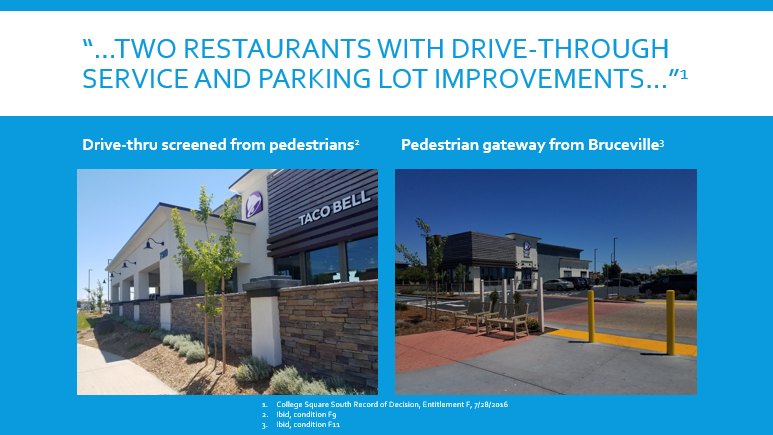 Their argument also referenced the two adjacent drive-through restaurant projects which the Commission approved in 2017. Furthermore, the Commission expressed concern that the parcel had remained undeveloped for 10 years (following the market crash) because the developer had not proposed a use that was more reflective of the City’s policies for creating walkable, neighborhood serving uses. Despite the attendance of dozens of residents from this neighborhood at the hearing in 2017 expressing their desire to see more community serving businesses rather than the two drive-through restaurants, tonight’s Planning Commission still approved this project, in part citing that very decision as justification. We do not see the role of the City Planning Commission as being the facilitator of economic development, but rather, as upholding the City’s own policies and ensuring development that is consistent with City and regional goals, community input, and best practices. As the Commission’s lone dissenter, commissioner Wang-Connelly stated, “The City’s planning horizons are much longer [than 10 years]” and as such, should make its decisions based on established policy. The charge of the City Planning Commission is not to create quasi-public policy but to support approved guidelines and law. After being approved by the Planning & Design Commission, the City Council previously fought vehemently to oppose a development that proposed a multi-pump Safeway gas station within a TOD in Curtis Park, a far more affluent community. We ask, why the inconsistency with the City Council that appointed this Commission? Would the City Council similarly oppose this project? Ultimately, it is true that the surrounding area is car oriented. However, to use that fact to give up on promoting Transit Oriented Development sets a troubling precedent for the rest of the City’s many suburban TOD sites with similar characteristics. Up and down California, communities from Los Angeles to the Bay Area are working to densify suburban communities and develop in a more transit oriented way. Examples from Dublin, Fremont, and San Diego show that suburban TOD is not only possible but highly lucrative. No one project will create a more walkable,transit friendly future, however, if we do not start by upholding our own policies, we cannot expect change to happen on its own. The proposed site is less that ¼ of a mile from a major transit hub for the City’s south area. Immediately to the east and south are existing and future planned residential units. 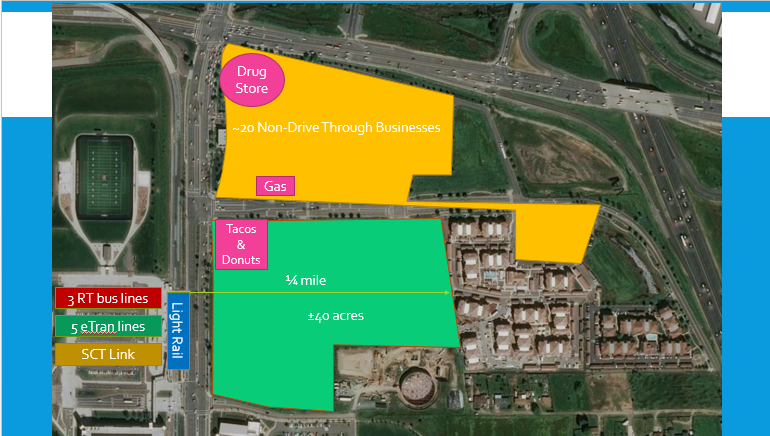 The City Planning & Design Commission placed several conditions of approval on the two adjacent drive through restaurants to preserve the site’s walkable and bikeable characteristics. This was done in order to maintain the development’s transit oriented nature. If this was the intent in 2017, why did Planning & Design Commission make the argument that the site did not “feel like a TOD” in response to the car wash? The original Planned Unit Development (PUD) guidelines stressed convenient pedestrian access through the site. 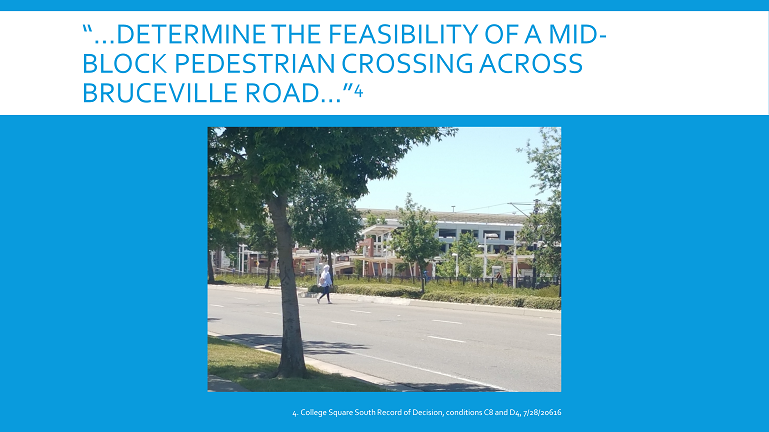 The development as approved at Planning & Design Commission differs significantly from the original PUD guidelines and treats pedestrian travel as an afterthought. Access across the site to residential areas requires 10 changes in the direction of travel and several drive aisle crossings. 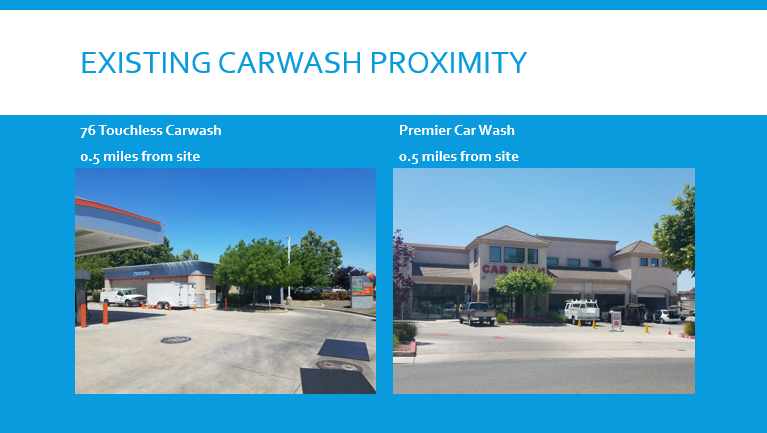 There are two other car wash facilities within .5 miles of the project site. Is a third carwash within a major TOD site really the best use for this parcel? Did the opposition of dozens of HEAL Zone residents to the drive-through restaurants not indicate to the Commission that this type of use was not supported by the community? 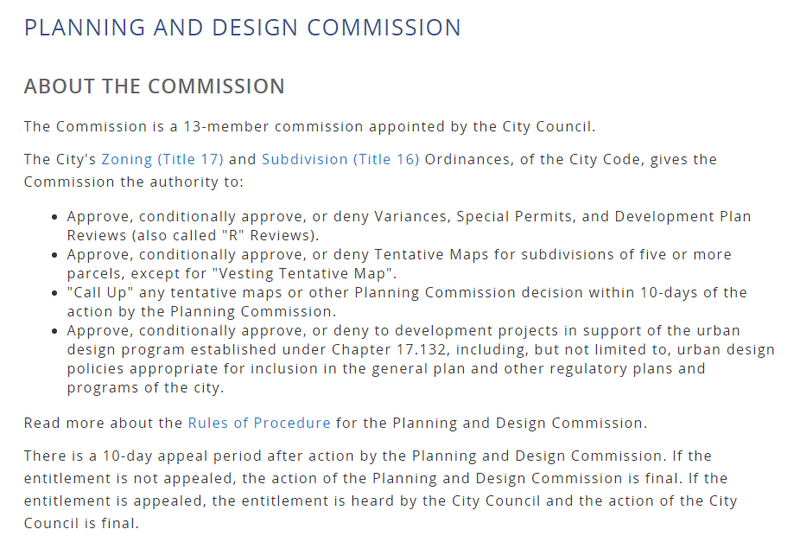 According to the City, the Planning & Design Commission’s charge is to approve, conditionally approve, or deny development projects based on the urban design program. It is unclear where the Planning & Design Commission has the authority to approve projects based on how long a parcel has sat vacant.